If you adored Lancôme La Vie Est Belle1 or any of its various spawn (Giorgio Armani Sì, Nina Ricci L’Extase, Salvatore Ferragamo Emozione et. al.) and you were hoping for more candied iris powder, do try Valentino's new-ish Donna, which I'd call the latest in the series except that I'm so far behind that Donna has been out for months and there are probably umpteen new fragrances in the same vein that I haven't even smelled yet. Ah well. Donna is the feminine counterpart to last year's Valentino Uomo, and it maintains that scent's emphasis on sugar, or to put it as Kevin did in his review, loads of sugar, at least in the opening. The top notes are a sweet 'n fruity blend, rather loud, cut by a touch of citrus and saved from toothache — just barely —by mild leather notes peeking through from the base (the notes: bergamot, Bulgarian rose, iris, patchouli, leather and vanilla). The heart is a lipstick rose-iris powder, very pink, very feminine and rather pretty, and considerably quieter than the opening. On my skin, the leather is essentially top-loaded and settles into a little hum of suede in the dry down, which is otherwise a vanillic powder, rather chalky, still a bit sweet but by now the sillage is minimal enough (it's very nearly a skin scent) that it doesn't overwhelm. The patchouli, as is nearly always the case these days, is entirely tamed and not likely to bother anybody. Verdict: Gosh, not bad, not bad at all. I have not had good luck with the Valentino perfume line, so I was rather surprised that I didn't hate it. I don't want to own it, and I like both Sì and Emozione better, but I found Donna easy to wear if rather too pretty-in-pink for my personal taste. I would have liked it much better if they'd toned down the candy in the opening, and maybe amplified the leather in the base, but still, not bad at all, and much more to my taste than the more youth-oriented Valentina. It's polite enough for office wear if you don't spray it just before you arrive. The lasting power is probably closer to what most people would expect from an Eau de Toilette. 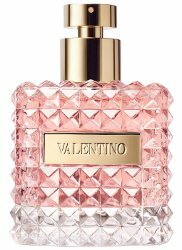 Valentino Donna was developed by perfumers Sonia Constant and Antoine Maisondieu. It is available in 30, 50 ($95) and 100 ($130) ml Eau de Parfum. 1. Of course, La Vie Est Belle did not start the trend — Jessica did not call La Vie "Angel with Botox and a blow-out" for nothing. It was such a great line, I think I’ve quoted it five or six times since then! I smelled this on a strip the other day. Forgot about it until I got home, pulled out the strip, and got an immediate impression of the bright pink confectionery known in Australia as the musk stick. The musk stick is a unique species, unrelated obviously to any animal source, or anything else in nature, but generally unlike anything musky in perfumery as well. It’s hard to analyse – the musk stick is a thing unto itself – but it probably has more in common with rose or rosewater, and violet perhaps, than anything else. Anyway, in Valentino Donna the musk stick impression probably came to me via the sweet accord mixed with rose, and the powdery chalky effects you mention. I feel sorry for that waif in the ad. She’s going to need more than Valentino Donna to get her through the slings and arrows of life. Should I lend her my Chanel No 19? LOL — the 19, or maybe a sandwich or two! Wow! Now that is interesting, especially for a perfume & candy lover like me. Hard to get outside Australia/NZ, I fear. Or perhaps the rest of the world is best off without! Nice review Robin. I think I will pass on this one..
Hey, money saved. It is a lot more expensive than it smells. It is extremely PINK…agree with comparisons to cotton candy skies or a pastel pink wall. It seems obviously related to La Vie but also has the lipstick accord in common with Chanel Misia — only Misia is several steps up the sophistication ladder from this one. And a very happy 2016 to you! Uhoh–I feel like I should whisper this, but I didn’t even much care for Misia. Hm. Well, only one way to find out! Well I don’t really know why I brought up Misia other than the lipstick thing, and there are tons of fragrances with rose-y lipstick accords. If you don’t like ANY of them I guess you probably won’t like VD either. Oh cool! Glad there was a decent 2015 mainstream release here under the wire! “Candy in the opening” does not usually call out to me, but I’m tempted to give it a try anyway–looking at Antoine Maisondieu’s oeuvre, I realize he’s really done quite a few I like or at least admire, even if they’re not for me (Magnolia Nobile, Velvet Orchid, BV Homme, as well as numerous Etat Libres and VC&As). And with your blessing! I’m not sure I’d call it all that more than decent (and seriously doubt it will be a huge perfumista favorite), but it is worth a shot, and agree, he’s a great perfumer — he made many of my favorite CdGs, among other things. That dress would invite tickling! LOL — I’m sure that is not what they want you to think it invites! I liked the Valentino Uomo which was marketed at masculine (but to me it is quite unisex). This one sounds interesting and I will definitely seek it out. The 30 mL bottle must look really cute and is the size I would go for. Would completely agree the Uomo is unisex!